A rare antique Chinese Ding bowl will be on sale with an estimate of million on Thursday at Christie's in New York. 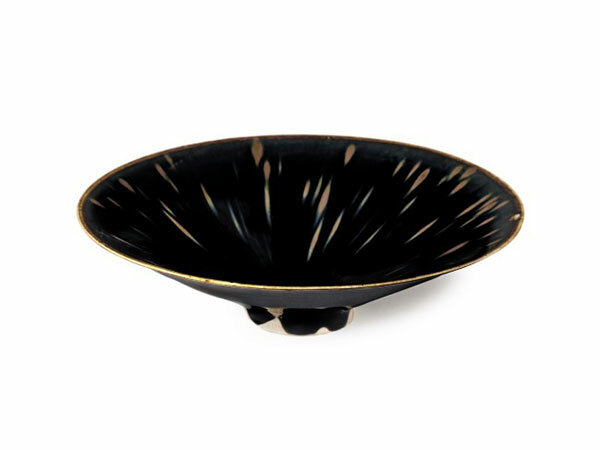 The museum-quality piece -- a Ding russet-splashed black-glazed conical bowl that dates back to the Northern Song Dynasty (960-1127) -- is estimated at million and becomes the highest estimate among the artworks offered at Christie's in New York in the on-going Asian Art Week sales, from March 16-23. Only three dark-glazed bowls with russet streaks are known to exist today, and the other two of them belong to Harvard Art Museum and the National Palace Museum in Taipei, China, according to experts. The ancient piece is described as a Ding bowl because of the county Ding in the Hebei province, China, where the kilns used to make the bowls were housed. Ding ware is regarded as one of the five great wares of the Song. "This vessel is believed to serve high society given its superb quality as the dark-glazed vessels became popular in the Song with the rising popularity of white tea." Olivia Hamilton, a specialist in Chinese Works of Art at Christie's New York, told Xinhua Tuesday. "The tea bowl was served during the tea ceremony: the shape and glossy glaze of the bowl perfectly match the whipped white tea powder," said Hamilton. Speaking of the Chinese ceramics market, Olivia added, "the market is always changing. But what is interesting now is that we still see a strong demand for Chinese ceramics. Market wise, ceramics from a specific period might appeal to a certain group of collectors. At the end of the day, artwork speaks for itself like this bowl." A Ding bowl with fine near-white body and an ivory-colored glaze was sold for .2 million at an auction at Sotheby's in March 2013. The rare Chinese bowl was bought for about from a yard sale in 2007 by a New York family who had it displayed in the living room.